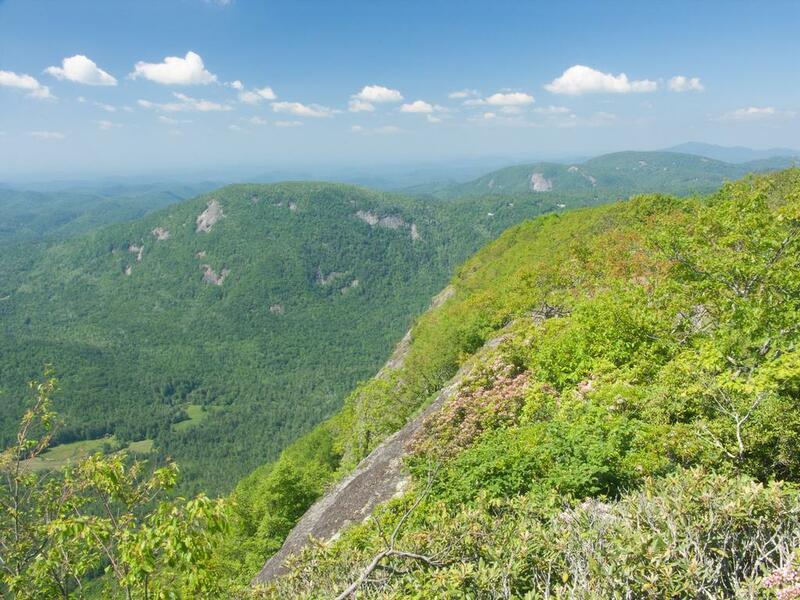 This excellent loop, designated a National Recreation Trail, climbs to the top of Whiteside Mountain, with its spectacular 700 ft high cliff walls lofting the hiker for amazing views. 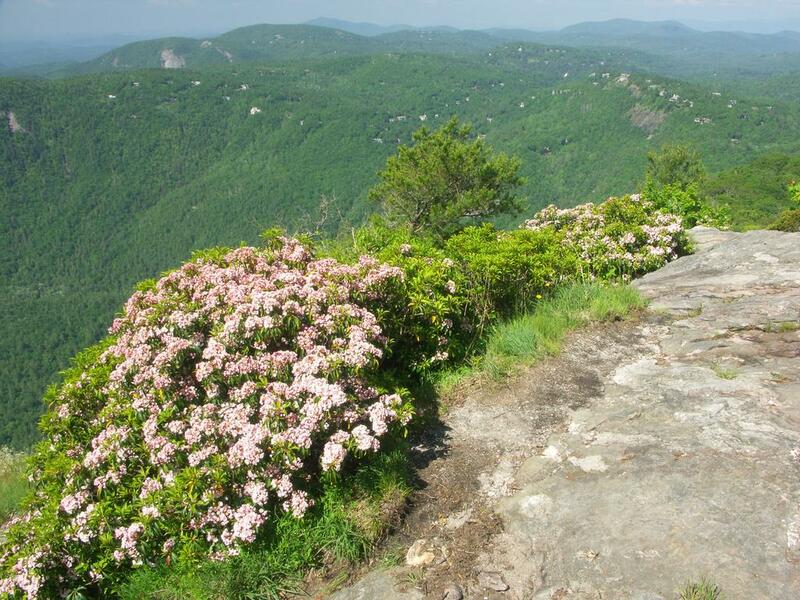 Take a camera, as the cliff-top views are lined with beautiful mountain laurel which blooms in mid-June. See relics from the past, when Whiteside Mountain was a tourist attraction. You'll pass through some pleasant woods along the way. From the corner of Main Street and NC 106 in Highlands, follow US 64 East for 5.4 miles. Turn right onto Whiteside Mt. Rd. (SR 1600). There is a sign for Whiteside Mountain Recreation Area. Follow for 1 mile to the signed parking area on the left. There is a $2.00/day area use fee at Whiteside Mountain Recreation Area. Begin the hike on the trail that leads uphill behind the sign boards. It starts out fairly steep, but soon merges with an old roadbed which isn't as difficult. You'll cross a wet-weather stream, then reach the point where the loop splits. This intersection is signed. You may follow the loop in either direction, but I prefer going right at the split, up the log and rock steps. Going this way involves a steeper climb at first, but it's a shorter way to the top and you'll get to the views more quickly! After starting up the steps, you'll quickly see how eroded the trail becomes in places. Although it's not terribly difficult, there are some large step-ups and deep trenches where running water has carried the soil away, and in wet weather there will be seepages and mud. (Note: from recent photos, it looks this section has been repaired with elevated trail structures - hooray! I need to go back and check it out, but it should be much easier now). After the initial set of steps, the trail isn't quite as steep, but it still climbs. You'll be traveling through a pleasant, cool forest of mixed hardwood trees, including a few hemlocks and an understory of laurel and rhododendron in places. The trail switches back several times in this first section. One switchback happens on an elaborate staircase structure below a small band of rock cliffs. The trail will reach the top of the ridge and the cliffs on the other side, where you suddenly catch a view through a narrow opening in the bushes. This isn't the best overlook, though - it's steep and dangerous. So skip this one and continue along the trail. The trail continues left, uphill, staying in the woods. One of the first views you catch from the Whiteside Mountain trail. The climb moderates, and the trail begins traveling along the top of the mountain and the edge of the main cliffs, through a pleasant forest. From this point on, side trails to the right lead to various overlooks. At first, there is no protection - so use common sense and stay well back from the edge. Some of the overlooks are relatively safe, but sometimes the rocks are too steep after your emerge from the woods to make a safe viewing area. Since there are plenty of opportunities further on to get a safe view, avoid taking risks here! As you climb, you'll reach the higher cliffs where the overlooks are more common. 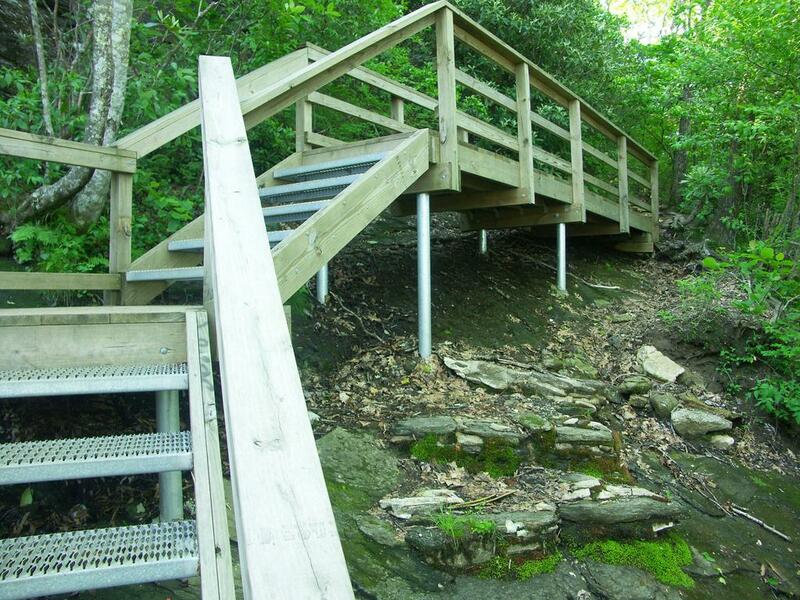 Railing has been installed along the main trail at some of the various viewpoints, as the trail climbs up and over rock outcroppings. Don't trust the rusty railing to hold you, though; rather think of it as a line behind which it is safe to enjoy the view. And what a view it is! To the right (southwest), you can see the rounded granite domes characteristic of the Highlands area, along with the small settlements, resorts, golf courses, and expensive homes for which the area is famous. Straight ahead (southeast) and to the left (northeast) are mostly mountains, with a few farmsteads lying in the picturesque valley below. 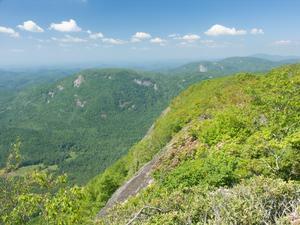 On the horizon, if it is clear enough to see that far, is the Piedmont region of South Carolina and Georgia, with lakes, towns, and various other man-made landmarks visible. To the far left is a ridge leading away from the main cliffs, where it is possible to get a sense of how steep and sheer the rock faces on Whiteside really are. The summit highpoint of Whiteside Mountain, 4,931 ft. elevation. The trail will reach the summit rock outcropping about halfway along the cliffs. 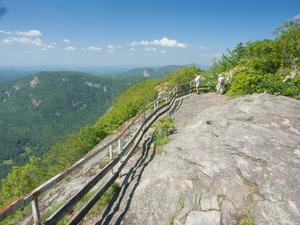 A triangular-shaped overlook with a large rock sticking up marks the spot, and on the back of the rock the name of the mountain and elevation is carved in. The trees - mostly oaks with a few pines, maples and other hardwoods thrown in - are short and stumpy, and mountain laurel grows profusely all around the area. Spring - particularly in mid June when the mountain laurel blooms - is an excellent time to visit. After going downhill for a bit from the summit, you start to get a view back toward the highest point on the mountain and of its highest cliffs. 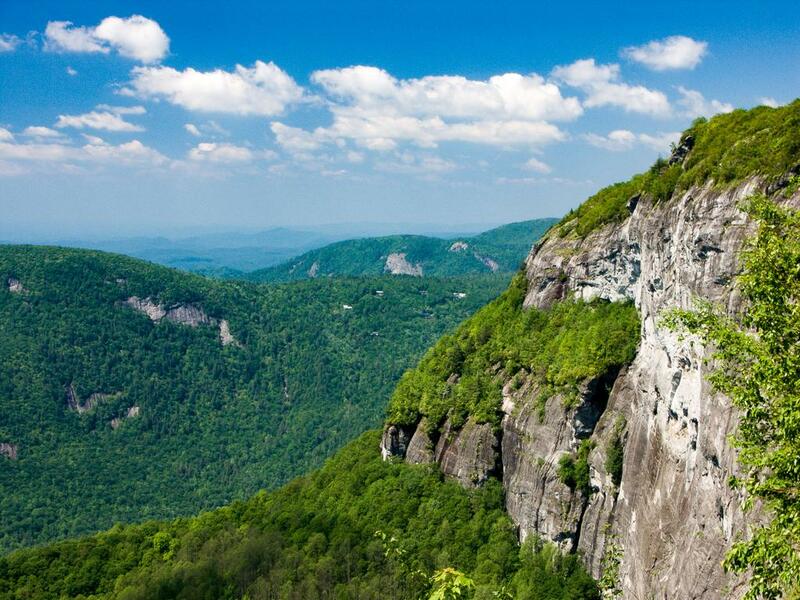 The best view of the cliffs themselves is next, from a concrete slab platform which appears on the right on a side trail, jutting out over the mountainside. This old overlook is the final safe place to enjoy the view, so get your fill before continuing on. You may have noticed a wide old roadbed on your left at times on the previous section of trail. 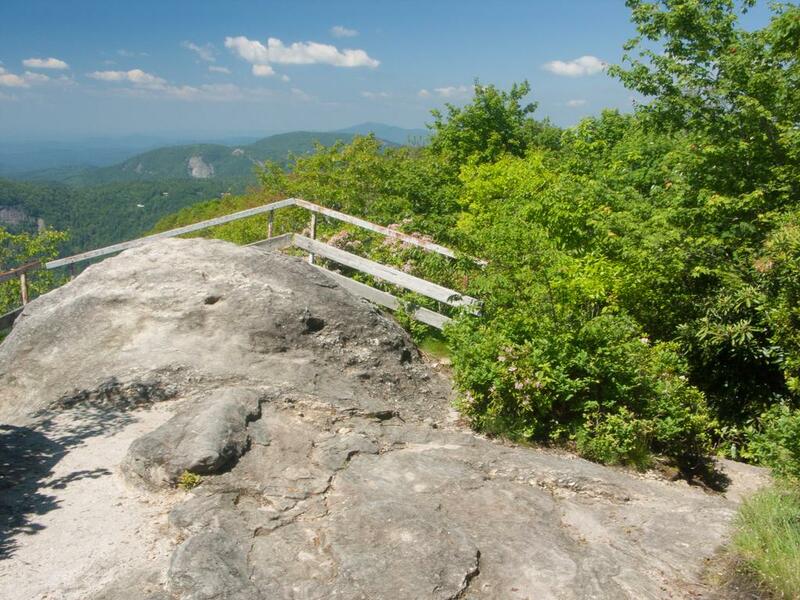 Now covered with trees, shrubs, herbaceous plants and wildflowers, this old roadbed used to carry tourists to this overlook and the top of the mountain as a tourist attraction, before the Forest Service bought the mountain in the '70's. A post office was located near the top, which was a popular place for tourists to mail postcards of the views! Just past the concrete slab, you'll reach an overgrown meadow, with a limited view to the northeast. Now you're back on the old roadbed on which the trail started. Bear left, downhill. This final segment of the hike is much wider, since it follows the old roadbed, with no views. But you'll be traveling through a very pleasant forest, much different from the one at the summit. It's a cooler, moister place, and grass sometimes grows in open areas between the trees and rhododendron. You'll see many more northern hardwoods such as birch and beech. During wet weather, seeps and very small streams will traverse the rocky old roadbed, after trickling and tumbling down the side of the road cut. Look above you to your left, and you might catch an occasional glimpse of the cliffs that line the north side of the summit ridge. They're not nearly as high as the ones on the south side from which you had an earlier view. You'll reach the close of the loop before long. Return to your vehicle straight ahead to complete the hike. J. Pezzi said: 11/11/18 We found an earring today on the trail. It looks like it would be special to someone. Please email me at jhigpez@aol.com if you lost an earring. Stephanie Massey said: I have hiked this trail many times. It is a 2.5 mile loop not 5. I recommend taking the traill to the left. It is wider and less steep for the ascent. Then you will be coming down the steeper side. Mary Gail Golden said: Fun hike!! Not the most challenging but the views are amazing! Channel Travel said: Hello, we are Channel Travel Agency from Ukraine. We are engaged in the selection of vacancies for students from the former Soviet Union (Russia, Ukraine, Belarus and Kazakhstan). We would like to know, do you need students for next summer? If you need workers for the summer season, starting in May, always happy to help. Regards, Channel Travel agency. Mary Jo Cobb said: Parents hiked 60+ years ago--where is the narrow "Squeeze Betsy?" Thanks! 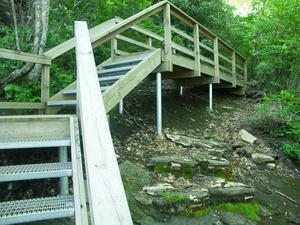 Mandy Griffin said: I've read that this trail is 2.5 miles round trip and 5 miles round trip. Can someone tell me for sure because I am a beginner and 5 miles would be a little much for me. 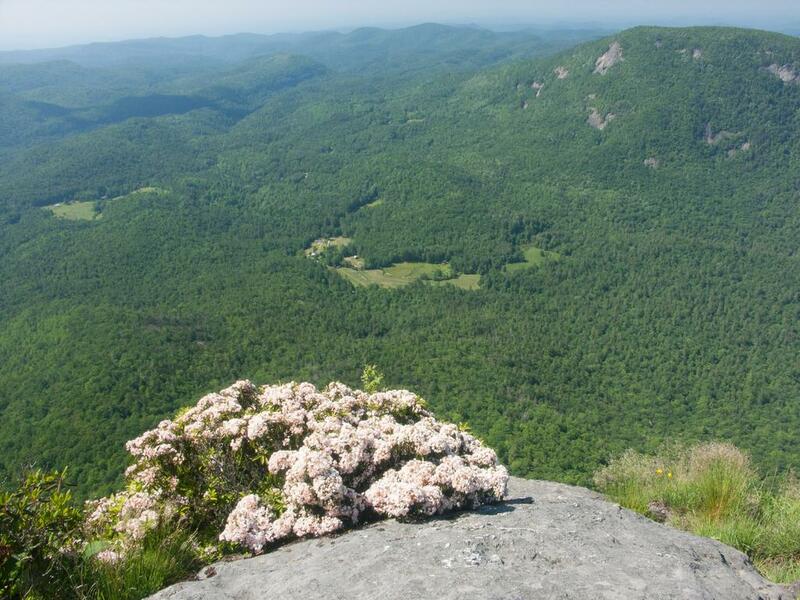 Colleen K said: Hiked on 4-26-14 Great hike, beautiful views. No water point in the parking area (that I saw) so don't forget your water. eileen bentley said: Awesome hike! 5 miles round trip and 766 calories burned. The views are amazing and it was very safe with rails and wired fences. The faint of heart should not venture here. Staying to the left means most of the steel climb is on the way down, but still a great workout. Carrie B said: Great hike, but I suggest breaking to the left at the steep steps and starting the route that way then coming down the steep steps.